Last year I started researching interactive student notebooks. I have always used a quick-write notebook, but this strategy takes that a bit farther. I teach 5th grade ELA. This blog will be an attempt to chronicle our notebooks’ successes and mistakes. Hopefully someone out there will read this and have some input. One thing that is necessary is a sturdy notebook. Many sites recommended the small, old-style composition books. I considered those, but the drawback was everything I copied for the kids would have to be cut down. One site recommended Mead 5-Star notebooks. I looked at those and decided to go with them. My preference is the 3-subject, college ruled with the plastic sleeve cover. It has multiple pockets inside. I purposely went with the college ruled to rein in some of my sloppier kids. That spacing is new to them and forces them to concentrate on bringing their writing under control to fit the lines. The plastic sleeve on the front is great because I have the kids personalize their notebooks with a custom cover. Rather than tape it on the front where it can get snagged on the edges, they simply slide it in the sleeve. After personalizing the cover, the last page of the book becomes the author page. I shared several different versions of an author page for examples. My favorite is Casey at the Bat, a Caldecott Honor Book illustrated by Christopher Bing. He adds personal touches and an illustration of himself. I gave the kids three table of contents sheets to glue into the first three pages. More on the glue in a moment. The contents pages had three columns: Skill, Standard, and Page Number. After the contents, they began numbering their pages, starting with 1 on the left side. Glue. Elmer’s. Don’t mess with glue sticks. Elmer’s is made for this. I showed the kids a die and explained that the pips on it were exactly the amount of glue needed to stick each corner into their notebook. You DON’T want them to cover the page like they’re putting ketchup on a hamburger. It’s unnecessary and makes the the paper gooey, causing it to rip when they try to write on it. The right side of the notebook is for whatever I present in class to them. The left side is where they do their work. Where they digest and transform the material. I require them to use 2 colors on my side and 5 colors on their side. Deciding how best to use the color makes them think about the material more in depth. 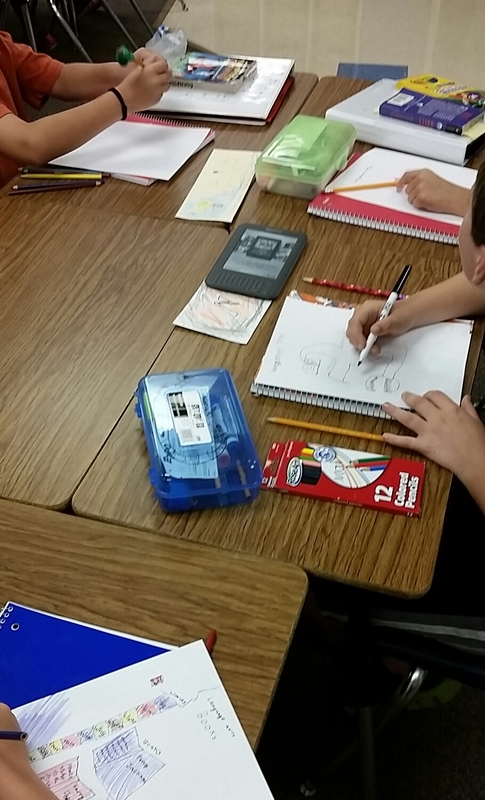 The first thing we added to our notebooks was close reading. It is central to Common Core and much of what we’ll do all year will center around it. In the photo above, I gave them our annotating marks on the right side (Mr. K’s side). We then did some practice with close reading on a handout. The next step was to complete the left side of the notebook (their side). I gave them a simple t-chart with “what it’s like” on one side and “what it isn’t like” on the other. The left side is a great place for Marzano strategies. Finding similarities and differences is the one that shows the most gain, and I plan to use variations of it all year long. After finding five of each, they then had to illustrate one of the items from the chart in the space below. So far I love the notebooks. They are a slow process to get started, however. Just like any procedure you want the kids to do all year, it is worth the time at the beginning of the year to teach them to do this the way you want it. Thanks for stopping by. Please, if you have experience with interactive student notebooks, join in the conversation. This blog will be all things middle school, but will have a lot of my experiences with the notebooks. Posted on August 24, 2014 by sslateacher	• This entry was posted in Interactive student notebooks, Uncategorized and tagged 5th grade, education, ELA, interactive student notebooks, Marzano, middle school. Bookmark the permalink. Love this! I actually am starting ISN’s this year! I’ve been planning for weeks. I also didn’t like the composition books. I am hoping the Mead Five Star Notebooks with plastic covers work! I am doing the same thing as you!